There’s a lot going on in the world right now. Between the news, the community and our personal lives, it can be pretty easy to get overwhelmed, stressed out and even upset. As human beings, our automatic reaction doesn’t always lean in the most positive direction. How can you live an altruistic lifestyle when negativity is on your mind? Today we've got the answers as we share six tips to help train your brain to be more positive. 1. Start your day off right. The best way to start your day off right is by making sure you take time to ease into the day and really prepare. Have a moment of quiet time in the morning by relaxing, meditating or just thinking through your day and positive life moments. Take some time to physically, emotionally and mentally prepare for the day. And of course, eat breakfast. 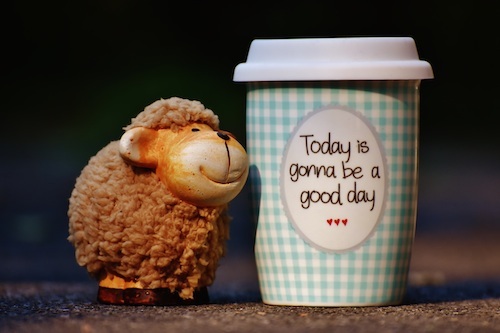 When you start your day off on a high note, the day will feel better overall, which leads to more positive thinking. 2. Make a gratitude list. Be positive by maintaining an attitude of gratitude. Take some time to sit down and consider the things in your life you are truly grateful for. Once your list is compiled, find a safe place to keep it where you can see it consistently. For example, on your phone, at your desk at work or on a bookmark. Read through the list as often as you can to remind yourself of all the good things in your life and maintain a positive mindset. When something challenging or difficult happens in our lives, it’s easy to immediately respond negatively. Instead, rewire your brain by making a conscious effort to rework every negative response you have. For instance, instead of thinking, “Wow, I hate having to work late,” consider, “This is building up my experience for better opportunities later on.” By immediately changing your negative response into a positive one, you inherently rewire your brain to think positively rather than the alternative. Too much idle time can result in opportunity for a downtrodden mindset. Instead, stay active and engaged with different activities and hobbies. Find things you enjoy to fill your time and thoughts with positive moments. If you’re more of a laid back person, you can still keep your mind active by reading books, playing games or even taking up writing. When you feel negative thoughts coming on, finding a positive outlet is a great way to channel them in a new direction. How can your brain be positive if your body doesn’t feel that way? Taking care of yourself physically, emotionally and mentally are vital to living a positive lifestyle. Make sure to eat healthy, get exercise and build joyful relationships with loved ones for a life you can feel good about. When you feel good, chances are your brain will follow suit with more positive ideas. Finally, when we give to others, we find joy in our own lives. Support others in your community by volunteering for causes you care about or donating to local nonprofit organizations. Supporting others is the ultimate way to give love, which you in turn receive. And when we put good out into the world, our brains reprogram to feel good and think good thoughts. If you want to live a more altruistic lifestyle, start by reprogramming your brain to think more positively. Try out these six tips to focus your thoughts and train your brain to be more positive. When we think positive, we send positivity out into the world for others to enjoy as well.